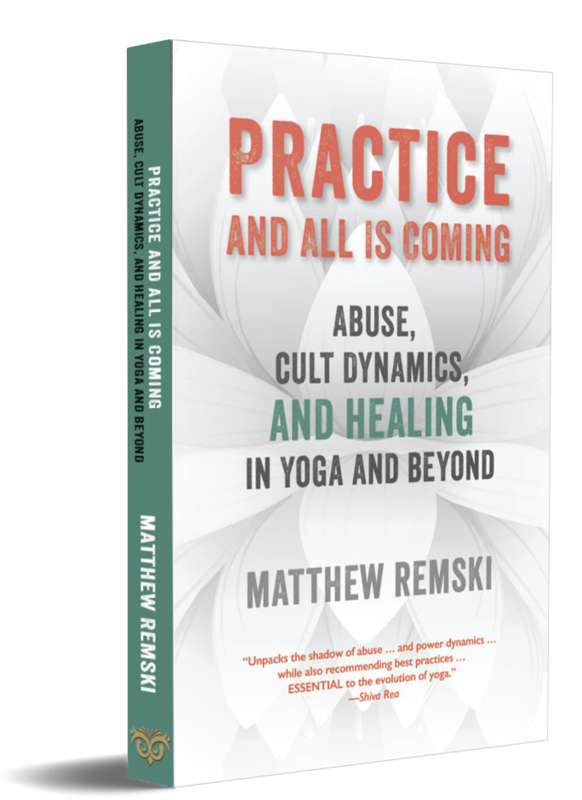 I’m stopping mid-read to just say this: For myself just entering yoga, in the early 90’s, as a not so young but still young adult –with a college degree from a liberal arts college in the field of social science and the arts…. I was –stunned– when I simply asked the ‘yoga school’ about their history and their modes-operendi. I was met with stony silence or worse. I was met with ‘that look’ looking back at you; a look like ‘what-the-who-the-heck are YOU –you silly odd person’. Shut up and surrender. But, since I was from a cultish-relgious background from childhood, pre-college, I knew that I NEEDED TO KNOW AND FULLY UNDERSTAND what I was entering in to. It was, obviously, MY RESPONSIBILITY to understand how my time and money would be invested. WHO ARE THESE PEOPLE AND WHAT ARE THEY UP TO. This is what anyone entering into a yoga education (or Yoga education) must be willing to ask. And if there is secrecy? If there is gaslighting? — GET THEE TO ANOTHER NUNNERY. Or else: Go Undercover and live to tell about it. Witness it, and report back. Thanks, Matthew, for making it clear how I can easily establish myself here as not a troll. I’m kidding. I doubt you have ever thought that even my blocked comments on your blog were straight up trolling. I always try to convey that I read your blog because you teach me tons, and I’m grateful. To your point about receiving “sympathy,” I’m also sympathetic to what you’ve been through cult-wise. I was a student of Pattabhi Jois in the 90’s. Turns out he was a very skilled predator who could prey on a few while completely masking that behavior. Of course, even after openly stating who my teacher was, I could still be a troll. And maybe I am because even though I agree with all your other points and observations in this piece, and though I understand why you think Yoga Alliance can help, it’s just not the reality. Not even close. The problems with YA’s existence are endless. Everything you wrote about why it’s wrongly hated is true. Have you ever tried to contact them with an issue, much less a complaint? It’s a nightmare. Overall they just want the money and the only reason they get it, even from people like me, is because they allow a false understanding of what they are to persist. YA is a registry. That’s it. That’s all they can be without becoming the yoga police. Think about it, Matthew. I’m sorry but you remind me of my yoga teaching feminist friends who bizarrely support the military because they want there to be some force out there protecting women, while the reality is that military women are the most likely women of all to be sexually assaulted. Nice fantasy but It makes no sense. YA is a relatively well intentioned communty mob ring that overcharges poor yoga teachers who pay up because YA succeeded in getting so many people to believe it is more than what it is. Registering people is easy and cheap. It’s just a matter of listing and super easy in the computer age. No one would pay their always rising registration fee if the world saw YA as merely a registry. Yes, it admits it doesn’t certify yoga teachers but really it willfully allows for the misconceptiin of it being a central certifying pseudo governmental agency to be perpetuated because that’s the key to it being paid millions a year for barely doing anything. If YA was a person it would be on your list of cult leaders. I tried my best to establish a new free version of YA but it’s cultush strangle hold on the yoga world is too tight. We are all stuck in a cultush relationship w it and, sorry Matthew, once again you are being snookered. Fortunately, as you did several times already in life, you will at some point use your great intelligence to see through to what’s really going on, and I hope it’s sooner rather than later. Seriously, call me a troll, but the history of YA is shameful. Something like 20 yrs ago, I was at the first yoga conference where YA had a small information table and a representative asking for our support and promising YA, for one thing, would never presume to establish yoga world standards. That was a huge lie. 200 hour yoga teacher training program anyone? I could go on from there, but again, I trust you will eventually figure this out for yourself. I don’t believe I’ve ever blocked a comment of yours. Trolls are bullshitters, and that’s not what I get from you. That said, I’m sorry you haven’t learned more about cult dynamics, or about good ways to talk to survivors, from reading this blog. That’s on me. But if you’re you’re not up on the SRP, now a year in, I’m afraid you can’t really know what you’re talking about when it comes to YA.